Eagle 75 – Protect Water for Future Generations. On August 6, 2015 over 600 motorcycles and riders formed the world’s largest motorcycle sculpture in Buffalo Chip, South Dakota on the 75th anniversary of the Sturgis Rally to honor veterans and call for the protection of water from uranium mining.The event was presented by the Black Hills Clean Water Alliance, and the Buffalo Chip and SpectralQ . Motorcycles and their riders formed the world’s largest motorcycle sculpture in Buffalo Chip, South Dakota on the 75th anniversary of the Sturgis Rally to honor veterans and call for the protection of water from uranium mining. The event was presented by the Black Hills Clean Water Alliance, the Buffalo Chip, and Spectral Q.
Here’s some photos of how it all went down! It was a BLAST. “I’m Peter Fonda, Inviting you to Eagle 75, a unique and free event at the buffalo chip on Thursday, August 6th. “The world’s largest motorcycle sculpture, the size of a football field, will be created in the image of a giant eagle flying over the Black Hills. This historic image will be photographed by helicopter. It honors two things of major importance to me: veterans and water. It takes courage to stand up for what’s right. It’s essential when it comes to our national security. 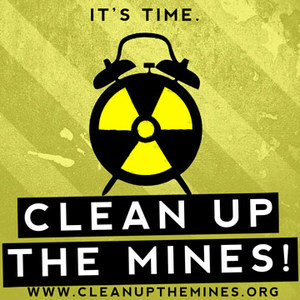 Foreign corporations want to mine uranium in the Black Hills, which threatens our ground water. Protecting our natural resources to ensure a clean, safe, healthy and strong America is on the list of what’s worth fighting for. Historically warriors have protected our homes, our food, and water. The EPA Public Comments are due on May 19, 2017 at 5:00 PM EST. Public Hearings are scheduled.